For a lot of people, the ability to totally change the way an iDevice looks is the primary motivator behind performing a jailbreak. 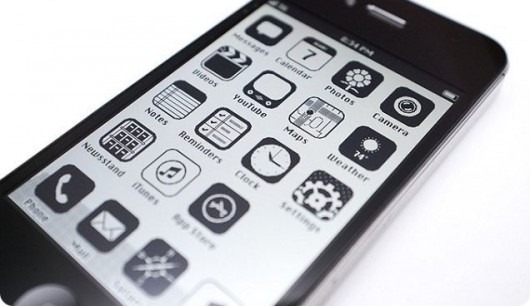 If you are new to the jailbreak or themes concept, by installing Cydia on the device, users can download an almost endless string of themes for use with the WinterBoard application which allows total customization of the iDevice. Users who open up Cydia and look through the themes section may be immediately put off due to the tons and tons of theme related options, but taking the time to filter through can prove to be beneficial as there are some exceptional pieces of work available which make your device look totally unique. But for those who don’t wish to sift through the junk to get to the gold, we have you covered and want you to introduce you to a very unique theme, unlike most others out there. Have you ever sat back with your iPhone in hand and wondered what it would be like if it was 1986? The iPhone and iOS is widely regarded as one of the most beautiful combinations of hardware and software, but what would iOS look like if it was created in the mid 1980s? Designer Anton Rodden came up with the OS ’86 concept over on his Dribbble account, in which he designed an OS for the iPhone inspired by what was around twenty six years ago. His work has subsequently been turned into an iOS theme which can be used with WinterBoard to give your device that mid 80’s look. The first thing to note is that not all of the icons have been included in the iOS 86′ theme which means that you will find some applications which look out of place on the Springboard. Some developers get round this by including an icon mask in the theme but unfortunately due to the nature of iOS 86′ this just would not be possible. The theme is fully Retina compatible and although I am not someone who generally installs themes, this looks retro and extremely beautiful with the contrast of the white background with the black inspired icons. The theme itself comes with a fixed set of themed icons which includes most of the Apple native applications. It also themes the dock, the folders and the badge which appears on icons for notifications making it a very accomplished theme. If retro is your thing then you can add the iThemes repository to your Cydia sources list and download the theme free of charge. The repository can be added by using http://repo.ithemes.it/ but we do feel the need to point out that adding that repo will cause Cydia to throw up an ethical warning based on user feedback. Please add this at your own risk.